This week I didn’t breastfeed on a Target toilet, but I did let my dog ingest an entire pan’s worth of beignet frying oil (that sort of thing appears in your house on the reg when you’re married to a chef). Consequently, the next 3 days were spent cleaning up el vom (baby spit up and dog oil laden grotesque varieties) and inspecting it for blood (the canine’s… not the child’s). Currently, Davey the Hubbers is upstairs steam cleaning the carpets. In a sad state of affairs, were I not heading back to work tomorrow, thusly requiring people to come to our house to care for our best girl, we’d probably just let our carpets stay stained for another few weeks (months). We are clearly disgusting people. But we’re very friendly. 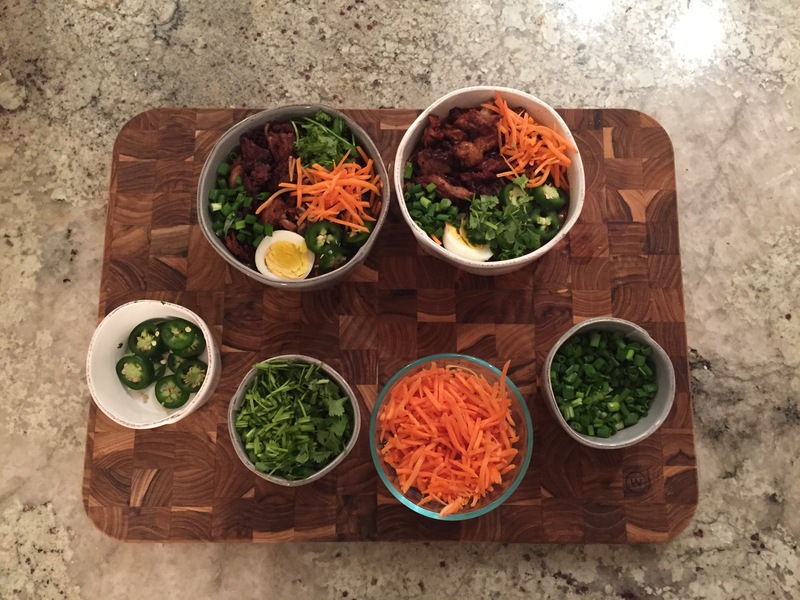 Crispy Pork Ramen Bowl – We stayed in for Valentine’s Day and drank wine and ate this extraordinary dish. Y’all. Please please please make this. It was out of this world. We paused Blacklist 3 times to exclaim over it. And we were so excited to leave church today, so we could go home and eat leftovers. I can’t wait to make it again. White Bean Cassoulet – We love this savory and comforting dish. With winter weather expected in our area in the coming days (yes, please, Lord Jesus! ), this will be a hearty, satisfying and healthy way to enjoy an evening by the fire. Swordfish Tacos – Fish tacos are one of my favorite things to make. I never fail to enjoy finding new ways to make them sing. On Friday night I used swordfish and seared it in a cast iron pan with salt and pepper, added some lettuce dressed in jalapeno olive and champagne vinegar, cilantro, salsa verde and sour cream and served them alongside some cumin and lime black beans and homemade jicama chips. The recipe here is also fabulous. Fiesta Chicken – An easy standby. As mentioned above, I’m heading back to work tomorrow (and am in serious denial and mourning), so I wanted something easy to throw in the crockpot that has a high yield for lunches and an easy dinner. Bam. Currently in the crockpot. Also on tap, some burgers made with local ground beef and topped with chipotle gouda (ooooh, it’s sooo gooooouda!!) and grilled hanger steaks. And wine. Double also, we’ve been inhaling this homemade coconut peanut butter cashew granola on top of smoothies every morning since Nora Beth’s been at home with us. And now I’m selling it! The first 12 oz. order will come in a mason jar for $8. Each 12 oz. refill after that is $6 and will fit nicely back inside the original mason jar. Email me at carolinearey AT gmail DOT com to order yours now!